Easels, paint, colored pencils, and drawings cover every surface of Keith Hanson's small wildlife studio in Marin County, California. A spotting scope is aimed out the front window at a Red Elderberry tree frequented by visiting birds. Birds flitted in and out of the courtyard. The studio, which opened in 1991, is located on the Point Reyes Peninsula, between the Pacific Ocean and the Bolinas Lagoon, which is a major thoroughfare for migrating birds. Hanson, who first took up drawing while he was still in high school, focuses on the accurate portrayal of birds. His perfect attention to detail combined with deep knowledge of his subjects informs his work. Where did you grow up? 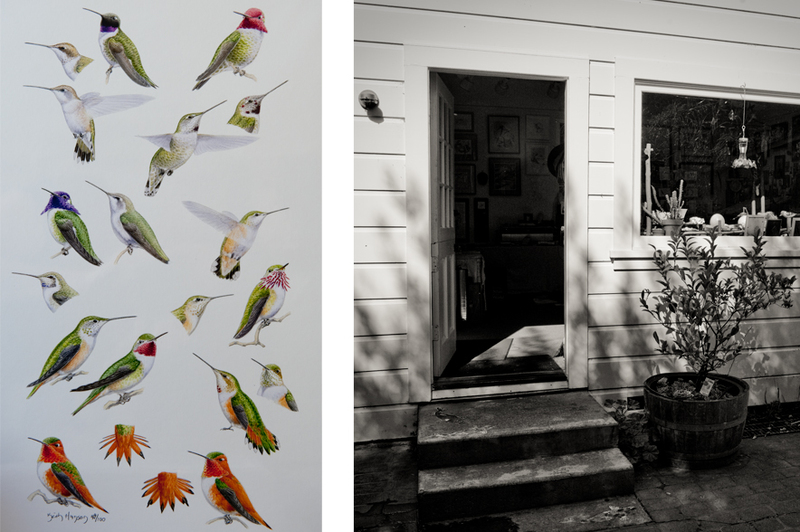 How did you end up opening your gallery in Bolinas? My parents are from Fresno but my dad was a military pilot so we moved to a lot of places while I was growing up including to Hawaii and Maryland. It was in the woods in Maryland that I saw my first Cedar Waxwing. It was the summer I was in sixth grade. It was so beautiful. That’s when I was drawn in. About a month later we ended up moving back to Fresno. That’s when my brother Rob began volunteering at the Point Reyes Bird Observatory, now called Point Blue. They do major research on bird conservation issues. Rob got his bird banding license and began banding birds on the Farallon Islands. I helped him and that’s when I really started to get a feel for birds, their shape, their weight. That understanding helps me tremendously with the drawing process. I really consider myself a birder first and an artist second. What is a bird banding license? You learn a specific safe technique for capturing and banding birds so you can study them. To capture them you use a very fine net called a mist net. Mist nets are so fine that you wouldn’t even be able to see one if it was hanging up in this courtyard. I understand that you have been documenting all the birds that you have seen from your studio window. What is your current species count? What are the most recent species you added to the list? Yes! We have the record for the most number of bird species seen from any single room in North America. The last one added to the list was a House Wren in September 2013 bringing the total to 224. My wife and I also record the birds we see from our home. We have the record there for the most birds seen from one building. I noticed that you have a lot of Hummingbird feeders in your courtyard. Do you worry these birds will become dependent on you? No, I used to worry about that so I conducted an experiment. I used a video monitor to record all the birds that visit the feeder and then identified ones with unique markings. I found that the same bird will not visit more than twice in one day, usually just once. Because hummingbirds must feed so often, this assures me they are finding plenty of food sources elsewhere. I illustrated a book called Birds of the Sierra Nevada: Their Natural History, Status, and Distribution. It contains detailed illustrations of over 160 rare species as well as information on their habits and ranges. 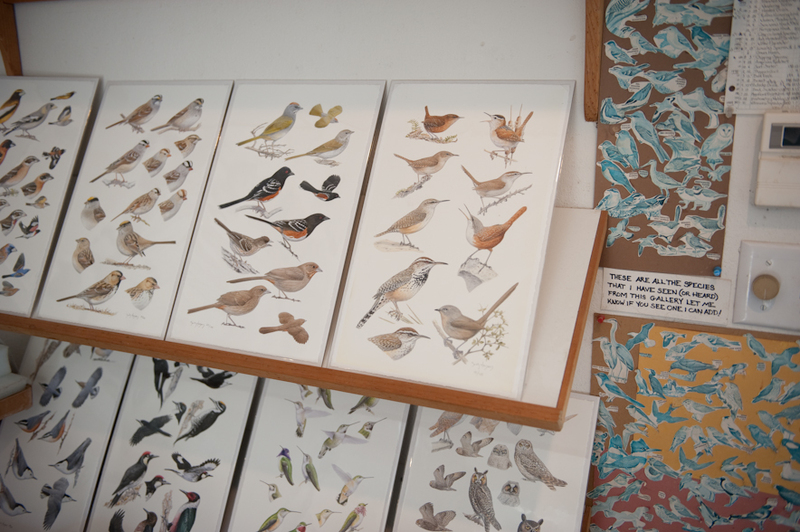 It’s been really great learning about all this species diversity at your Bolinas studio. But how much can people in more urban areas see? Are there any particular birds you would recommend looking for? Absolutely! You can see all sorts if you take the time to look. I recommend starting with Peregrine Falcons because they are easy to identify. Note the bird viewing scope in the right part of the photo. The scope is attached to a monitor to allow easy bird viewing.